Time to go green! 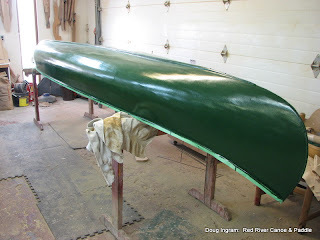 Two coats of green paint on the old Chestnut and she's looking like this. Time for a good sanding and two more coats. I'll be installing the stem band today, and the new bow seat is ready for caning. Get the paint done, the stem bands on, the seats and thwarts in and she's all finished up and ready for the water!